The Battle of Franklin is often referred to as the "Pickett's Charge of the West." 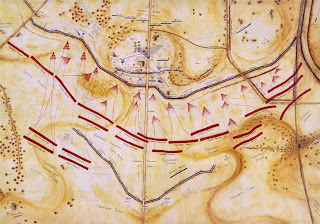 18,000 Confederate soldiers of the Army of Tenn. crossed over more than two miles of open ground in a frontal assault against Federal troops under the command of Major General John Schofield. The result was especially devastating on Southern Generals. Five died in combat.....Major General Patrick Cleburne, Brigadier Generals John Adams, Otho Strahl, States Rights Gist and Hiram Granbury. Brigadier General John Carter, who was mortally wounded died within ten days.